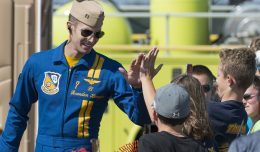 Selfridge Air National Guard Base in Southeastern Michigan celebrated its 100th anniversary with an open house and airshow headlined by the Thunderbirds and featuring one of the best flying lineups of any airshow this year. The Trojan Horsemen making their first pass during Saturday’s airshow. Located about 20 miles northeast of Detroit on the shore of Lake St. Clair, the base is named after Army Lt. Thomas Selfridge, who, in 1908, became the first person to die in an airplane crash. While on a demonstration flight with Orville Wright himself at the controls, one of the aircraft’s propellers broke, causing a vibration that damaged the aircraft enough to send it into a nosedive. Less than ten years after the crash, the Joy Aviation Field was established on the shores of Lake St. Clair as a test site for the Packard Motor Company’s early aviation engines, and was then taken over by the US Government for use as an Army Air Service training facility when the United States joined World War I. One of only nine military airfields at the time, Selfridge’s became the home of the Curtiss JN-4 Jenny, the first in a line of base aircraft that would eventually include everything from Spads and Mustangs to Vipers and Warthogs. Selfridge was an early training base for the Tuskegee Airmen, and has earned the nickname “Home of the Generals” by hosting famed aviators Curtis LeMay, Carl Spaatz, and Jimmy Doolittle during their careers. Today, Selfridge ANGB is home to personnel from all five branches of the armed forces, as well as a Customs and Border Protection patrol wing, owing to its location just 10 miles from the Canadian border. The main Air National Guard unit is the 127th Air Wing, which includes the Michigan Red Devils of the 107th Fighter Squadron flying A-10Cs and the 171st Air Refueling Squadron flying the KC-135R. Selfridge is also one of five ANG bases being considered to house an F-35 squadron, which would see the return of fighters to the skies over Southeastern Michigan for the first time in nearly a decade. The airshow’s Friday night kickoff party was headlined by the country band A Thousand Horses and featured a night airshow with afterburner passes from Randy Ball’s MiG-17F, skydiving by the all-female Misty Blues team, and an aerobatic pyrotechnic show from Bill Leff in a T-6. 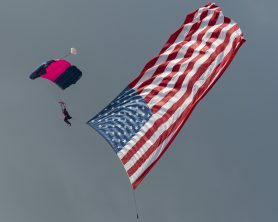 Each show day began with the national anthem and a traditional flag jump from the Misty Blues with the jumpers being circled by Buck Roeteman in a Pitts biplane. After all of the jumpers were on the ground and their aircraft landed, Buck launched into a teaser routine, wringing out his yellow and black airplane to open the flying portion of the show. 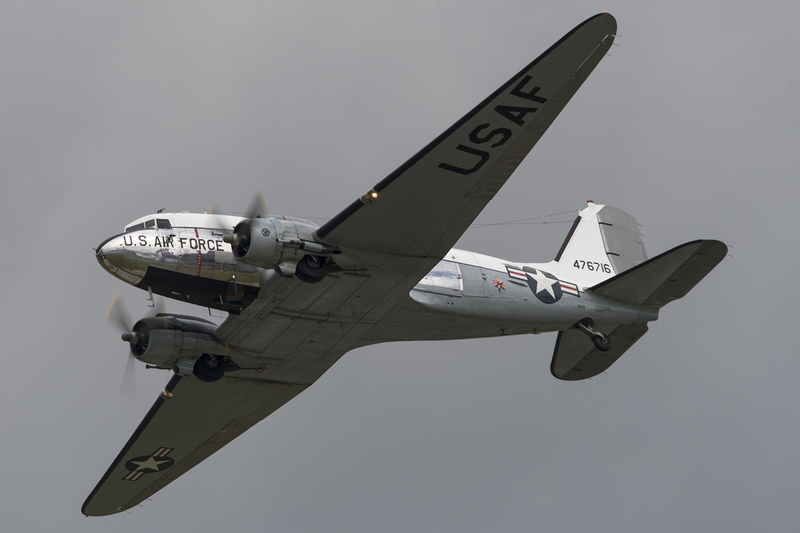 In keeping with the theme of Selfridge’s centennial, the flying program was set up in chronological order, showcasing the base’s history and the progress of US military aviation. 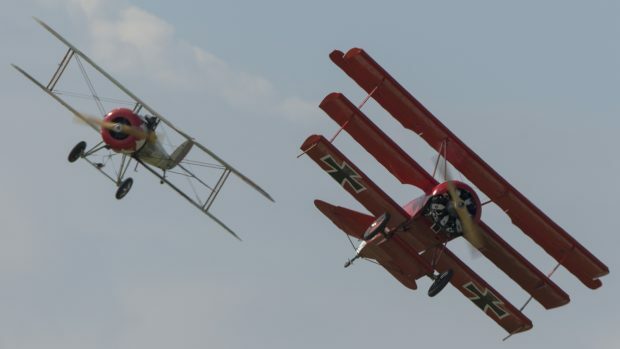 First up were a trio of WWI-era aircraft, with replicas of a Fokker Dr.1, a Sopwith Strutter, and a Nieuport 28 taking to the skies and weaving a figure-8 pattern over the field. The formation opened the show in place of a JN-4 Jenny, as the originally scheduled aircraft was damaged in a forced landing on the way to Michigan for the show. 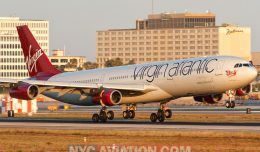 Thankfully, pilot Terry Richardson was not seriously injured. With the fragile WWI planes back on the ground, the WWII portion of the show began with a mass launch of fighters, trainers, bombers, and even transports, nearly all of which have ties to Selfridge. Airshow fans were treated to a number of passes from a P-39, P-40, P-51C, P-51D, B-17G, B-25, C-47, Hawker Hurricane, and a handful of T-6 Texans/SNJs. Each aircraft was able to make a number of flat and photo passes and the Tora Bomb Squad provided strafing and bomb effects to add to the ambiance. In the hands of skilled aviators, the rare warbirds were able to put on an impressive show and filled the skies with the sounds of freedom as heard in 1945. The Trojan Horsemen flew next, putting the mighty T-28s on display with a combination of formation grace and solo performance demonstrations similar to other formation teams, albeit with the growl of large radial engines as they carved graceful arcs across the sky. 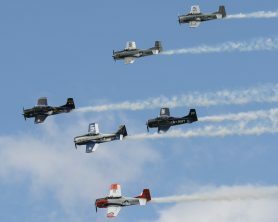 The Bremont Horsemen P-51 demo team was also scheduled to perform at the show, but cancelled for unknown reasons. The remaining warbirds did a great job of filling in the gap, and a short demo by the Tuskegee Airmen P-51C gave fans their fix of Merlin noise for the day! Greg Colyer and his Lockheed T-33 “Ace Maker II” brought the show into the jet age much as the T-33/P-80 airframe did for the US Air Force just after WWII. Colyer’s routine is familiar to East Coast airshow fans, and it is always a treat to see his graceful handling of America’s first jet trainer. A short deviation from history was next, as Greg Koontz went up for his first demonstration of the day in an Extreme Decathalon. The high-wing red monoplane is used for basic aerobatic training and competition, and Koontz showed his mastery of the aircraft, flying an impressive routine managing energy and performing crisp maneuvers all while narrating his routine live from the cockpit in his signature easygoing Southern style. 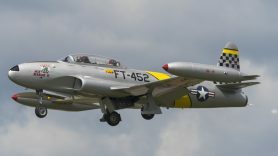 The Korea portion of the show was represented by Paul Keppler in his F-86 Sabre flying a short demonstration aboard one of the best looking fighters ever to grace the skies. This particular airframe is painted in the colors flown by Maj. James Jabara, the first jet ace in the USAF and the second highest scoring USAF pilot of the Korean conflict. Airshow fans were treated with Dr. Joe Masessa’s rare OV-1 Mohawk as one of the aircraft to take to the skies during the Vietnam commemoration. In addition to the tri-tailed twin-turboprop observation plane, an F-100 Super Sabre and a MiG-17 took to the skies, and all three aircraft mixed it up with mock dogfights. The MiG was slated to go head to head with the Collings Foundation’s F-4 Phantom, but maintenance issues grounded the aircraft before it could even get to Selfridge. Even without the Phantom, the show delighted with the Mohawk’s simulated attack runs, the F-100’s distinctive afterburner pop, and the flickering trail of fire coming from the back of Randy Ball’s MiG-17. Dean Cutshall’s F-100F Super Sabre is one of only a handful of surviving airframes from an initial production run of over 2,200. With such rarities in the air, the Vietnam-era display was truly an avgeek’s dream. 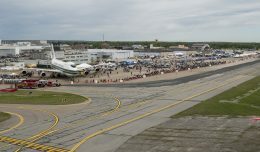 Thanks to a last minute authorization from Air Combat Command, Selfridge Airshow patrons were treated to an unplanned act at the show that brought the present and possible future of the base together in the sky. One of the F-35s in town for the static display at the show took off and joined in formation with the newly-painted 107th Fighter Squadron centennial commemorative A-10C (81-0994) for a heritage flight. 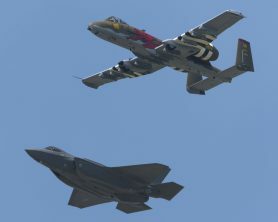 While the F-35 was limited to a few formation passes and a pattern, the sight of the A-10 next to a 5th generation stealth fighter was impressive, and an powerful display of the broad capability and mission range of the US Air Force and Air National Guard. 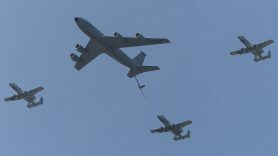 Having launched earlier, four other Selfridge based A-10s, along with a KC-135R were soon overhead for the hometown Combat Search and Rescue (CSAR) demonstration. 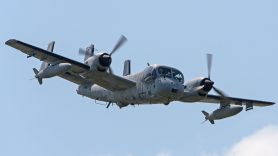 After the Hogs passed overhead with the Stratotanker in a simulated aerial refueling position, the SANDY flight of A-10s began to make strafing and bomb runs in support of a “downed aviator” in need of rescue. After suppressing the hostile forces, a Coast Guard MH-65D Dolphin from the Selfridge-based CG Air Station Detroit played the role of rescuer, landing at show center to pick up the stranded pilot as the KC-135R made passes overhead. While not as involved as some of the combined arms demonstrations at other shows, the joint display at Selfridge allowed three hometown units from two different services to show off their capabilities to the gathered crowds. 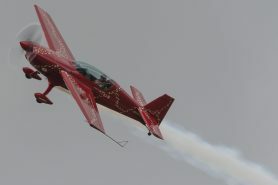 Jacquie Warda, known as “Jacquie B” took to the skies next in her Extra 300L and tumbled around the airspace over Selfridge. Having not taken up aerobatics until she turned 50, Jacquie B has become a prominent member of the airshow performing community and hopes that her performances inspire other ladies both young and young at heart to take wing and discover the joys of aviation. The US Navy was represented by the Legacy Hornet TACDEMO from the VFA-106 Gladiators, based at NAS Oceana in Virginia Beach, VA. Lt. Nick “Bearshark” Green and Lt. Joe “Pound” Ash both flew aggressive and entertaining demos in an F/A-18C. From takeoff to touchdown, the pilots exhibited the full subsonic flight envelope of the current backbone of the Navy’s air arm from the tail-sitting high alpha pass to the high-speed photo pass that closes out the demonstration. NYCAviation was on hand prior to Friday’s demo to experience the professionalism and skill that goes on behind the scenes, as the pilots briefed the demonstration and the ground crews prepared and launched the fighter for the performance. It goes without saying that none of the noise and vapor would be possible without the hard work of the team on the ground who make sure the pilots have a safe and reliable aircraft. Buck Roeteman’s full demo followed the Hornet, and provided him additional time in the aerobatic box to show off the agility of his Pitts. The black and yellow color scheme provides a bit of a nostalgia as it matches the livery used by the late Jim LeRoy who was one of the most well-known civilian aerobatic pilots of the past few decades. 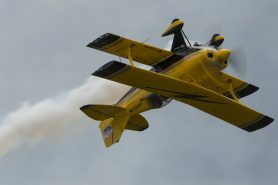 Buck’s performance included a low-altitude ribbon cut in addition to a series of maneuvers that showed just what a Pitts can do. With Roeteman’s Pitts back on the ground, the field was turned over to America’s Ambassadors in Blue (or Red on Sunday), the US Air Force Thunderbirds. With an absence of convenient staging areas, the Thunderbirds did not perform their ground show, and taxied out to the runway immediately after taking the field to begin their demonstration. 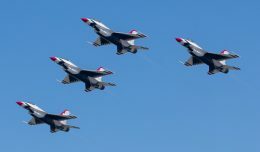 The six red, white, and blue F-16s performed for the better part of an hour, slicing through the sky in their traditional mix of familiar tight formations, head on opposing passes, and displays of the performance envelope of the most numerous and nimble fighter in the Air Force inventory. On Sunday, NYCAviation had the honor of seeing the Thunderbirds perform from a perspective rarely seen: at the comm cart with members of the team. In addition to the narration and communications hub, the team’s PA music, safety observation, weather updates, show video, and centerpoint signals all come directly from the team members around the team’s trailer known as “Judy.” As one would imagine, the level of professionalism and camaraderie among the team members was truly a spectacle to witness firsthand, and it is evident that the team not only enjoys their jobs, but sincerely enjoy spending time on the road working together. 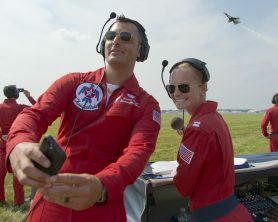 As a bonus, the photos were captured on Sunday, as the T-Birds donned their special red flight suits in celebration of the 100th Anniversary of Selfridge. 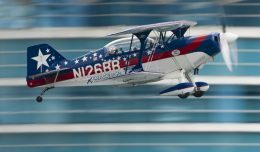 Ending a show weekend with such an intimate look at one of the world’s premier demonstration teams was going out on a high note for an already memorable show and the experience was one that this airshow fan will never forget. The author would like to thank the 127th Wing and the rest of Team Selfridge for hosting the airshow and for 100 years of standing ready to help keep the USA safe. Additional heartfelt thanks are owed to the US Navy TACDEMO Team, LiveAirshowTV crew, the Selfridge sound team, and the US Air Force Thunderbirds for everyone’s assistance in ensuring the photos that accompany this article could happen.